It is widely documented that children who are more physically active at a young age can lead to continued participation in physical active later in life. It is important to encourage children to be physically active in the early years to give them the best possible opportunity of creating a positive relationship with physical activity. 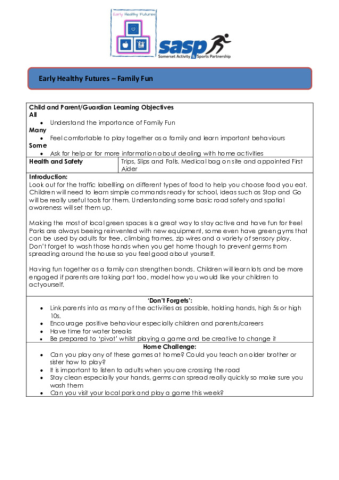 Full of Beans is a set of resources that has been designed by the early years team at SASP and Zing Somerset (Somerset CC Public Health commission). The resources are for those working within EYFS to deliver sessions to children and families in EYFS. The aim of the resource is to make physical activity fun and engage families to participate together. 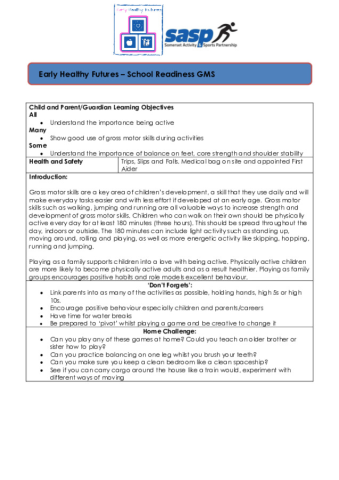 While the resource focuses on increasing physical activity levels and is delivered in a fun thematic way it also has a variety of other key learning elements, such as; Healthy eating, physical development and playing together as families. As a part of our ongoing support to the EYFS examples of these plans are available to download. Plans consist of an introduction page followed by a lesson with 4-6 different activities; further lessons are available on request.